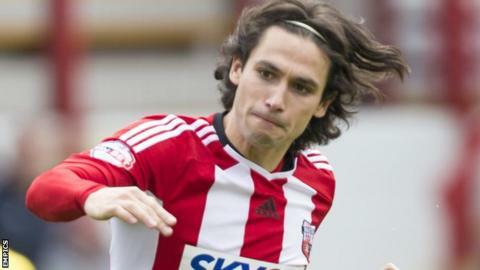 Brentford will face Middlesbrough in the Championship play-offs after they comfortably beat relegated Wigan. The Bees were lifted into the final play-off spot on goal difference after Alex Pritchard's first-half free-kick. Jota's goal took the hosts into fifth place, above Ipswich Town on goals scored, before Andre Gray made it 3-0. Despite James Tarkowski's late missed penalty, Brentford - promoted from League One last team - sealed fifth as Ipswich lost 3-2 at Blackburn. Elsewhere, Derby lost 3-0 to Reading while Wolves won 4-2 against already-relegated Millwall, meaning the Molineux side missed out on a play-off place on goal difference. Wigan had the first chance of the game when Marc-Antoine Fortune powered down the left wing but David Button parried his shot away and also saved from Gaetan Bong. Fortune had a goal disallowed before Pritchard put the hosts in front, the midfielder's long-range free-kick taking a deflection off the wall and beating Lee Nicholls. Buoyed by the opener, which took Brentford in the final play-off spot as it stood, the onrushing Alan Judge almost doubled their advantage. Jota made it 2-0 immediately after the restart when he tapped home following Moses Odubajo's through ball, and Gray grabbed a third for Brentford 10 minutes from time with a close-range shot after Jota's pass. There was late drama as Nicholls saved defender Tarkowski's late penalty for the hosts, after Judge was tripped up by Don Cowie in the area. Brentford manager Mark Warburton: "I'm delighted for the players and supporters. We always said where can we be by 2 May, and here we are in fifth. "We spoke to players on 25 June, the first day of pre-season training, and told them we had no doubt where we could go. And they've achieved it. "It could have come down to one goal, there are so many late goals in this division. But once we knew Derby were 3-0 down we could enjoy the last couple of minutes." Wigan manager Gary Caldwell: "It was frustrating, especially in the second half, we were not good enough in every department. "We knew they would come at us and we didn't deal with it. I won't accept performances like that. We have a long summer ahead of us to do something about it. "We need people to come to the club who want to be at the club, and who want success. We will work very hard to get the right characters in and rebuild." Match ends, Brentford 3, Wigan Athletic 0. Second Half ends, Brentford 3, Wigan Athletic 0. Attempt missed. Alan McCormack (Brentford) left footed shot from the centre of the box is close, but misses to the right. Assisted by Tommy Smith. Harry Maguire (Wigan Athletic) wins a free kick in the defensive half. Penalty saved! James Tarkowski (Brentford) fails to capitalise on this great opportunity, right footed shot saved in the bottom left corner. Penalty conceded by Don Cowie (Wigan Athletic) after a foul in the penalty area. Penalty Brentford. Alan Judge draws a foul in the penalty area. Corner, Brentford. Conceded by Lee Nicholls. Attempt saved. Jonathan Douglas (Brentford) right footed shot from the right side of the six yard box is saved in the centre of the goal. Assisted by Alan Judge. Attempt saved. Jermaine Pennant (Wigan Athletic) right footed shot from outside the box is saved in the centre of the goal. Corner, Brentford. Conceded by Jason Pearce. Substitution, Brentford. Alan McCormack replaces Toumani Diagouraga. Substitution, Brentford. Tommy Smith replaces Andre Gray. Offside, Wigan Athletic. Louis Robles tries a through ball, but Billy McKay is caught offside. Goal! Brentford 3, Wigan Athletic 0. Andre Gray (Brentford) right footed shot from the centre of the box to the bottom right corner. Assisted by Jota with a through ball. Jermaine Pennant (Wigan Athletic) wins a free kick on the right wing. Jermaine Pennant (Wigan Athletic) wins a free kick in the defensive half. Offside, Wigan Athletic. Don Cowie tries a through ball, but Billy McKay is caught offside. Offside, Brentford. Alan Judge tries a through ball, but Andre Gray is caught offside. Stuart Dallas (Brentford) wins a free kick on the left wing. Foul by Billy McKay (Wigan Athletic). Harry Maguire (Wigan Athletic) is shown the yellow card for a bad foul. Foul by Harry Maguire (Wigan Athletic). Substitution, Brentford. Stuart Dallas replaces Alex Pritchard. Attempt saved. Jota (Brentford) left footed shot from the right side of the box is saved in the centre of the goal. Assisted by Alan Judge. Substitution, Wigan Athletic. Louis Robles replaces Marc-Antoine Fortuné. Substitution, Wigan Athletic. Jordan Flores replaces Tim Chow.